Origins: Selected Arabica Origins from Central, South America and Africa. 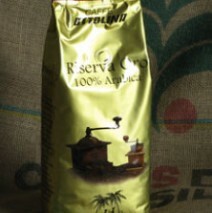 Green coffee beans purchasing: Selection and purchase of green beans from the producers. First Cleaning: Vibrating and pneumatic filters remove all solids from the green beans (lighter than green beans). Green beans storage: Green beans are stocked in silos. Blending: The blend is composed by mixing the origins chosen for its preparation. Roasting: Roasting the blend at the correct degree. De-stoning: Vacuum cleaning of all residual impuriites (heavier than roasted coffee). Tasting: Visual and sensory analysis of samples of the blend. Packing: After the correct seasoning (0 to 48 hours), coffee is packed in the best way to preserve the blend’s characteristics. Delivery: Delivery to our customers.